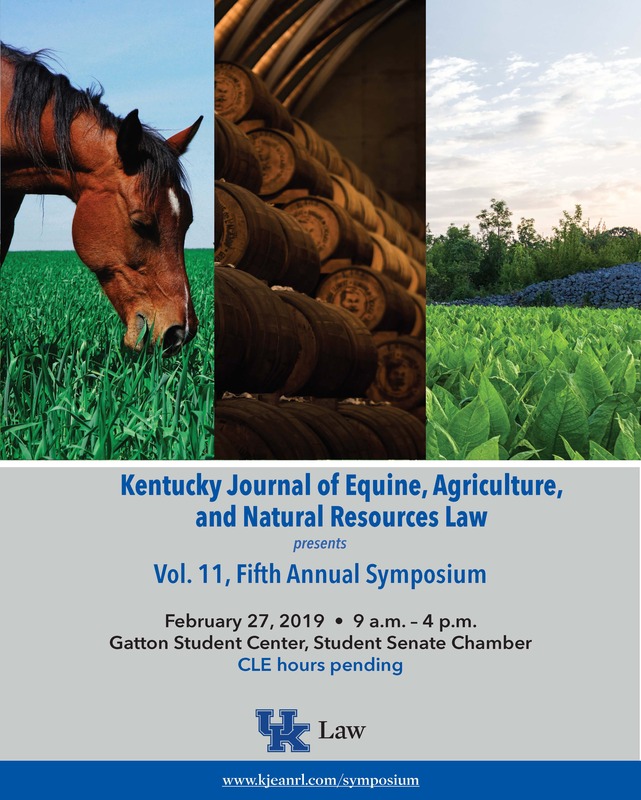 The Kentucky Journal of Equine, Agriculture, & Natural Resources Law (KJEANRL), in conjunction with the University of Kentucky College of Law, will host its fifth annual symposium on Wednesday, February 27 in the Student Senate Chamber at the Gatton Student Center. The event is free and open to the public and takes place from 9:00 a.m. – 4:00 p.m. The sessions will feature discussions regarding state-federal relations; thoroughbred racing, wagering and sales; the past, present and future of environment protection; and the intersection of agriculture labor and immigration policy, and sports wagering regulation. Attendees are encouraged to participate by posing questions throughout the symposium. To register for the event or to see a full agenda, visit http://www.kjeanrl.com/symposium-registration/. CLE credit is pending approval. The KJEANRL is a multi-disciplinary journal of law, science, and policy published twice annually by the University of Kentucky College of Law and edited entirely by students of the College of Law.